For a long time, I’ve been skeptical of academia, and deeply suspicious of the mind, which tends to get the wrong end of the stick on many occasions and is, let’s face it, a bit of a monkey. So I wasn’t so sure how I would get on with an MA in the Traditions of Yoga and Meditation – where the mind gets very involved in yoga. It has also been more than two decades since I went to university the first time around… so how would I fare with academic texts again?! Eeep. However, there were two factors that swayed me. The first was the subject: MA in the Traditions of Yoga and Meditation? Golly, yes please. The second was the university: the School of Oriental and African Studies, aka SOAS, which appeals because it combines my history with Zimbabwe and my Indophilia + unshakeable dedication to this thing called yoga. So last September, I enrolled. I had no idea what I was getting into. A term and a half in, and I’m up to my eyes in studies (in a VERY good way!). The readings, the essays, the staggering volume of knowledge that is out there to imbibe, digest, contemplate. It’s a very humbling experience being on this Masters course. The more I read, the less I realise I know. Consequently, some things in my life have taken a back seat… this blog being one of them. I have also put my full-day workshops on the back-burner for the next while (the half-day ones are still on). This MA brings into sharp perspective that time is so precious, and every free moment I have, I’m poring over textbooks on Tantra and journals on Jainism. So my dedicated weekly posts have dropped back. I will, however, write whenever something exciting happens… such as… day 500 of Kirtan Kriya which is today (post coming soon)! 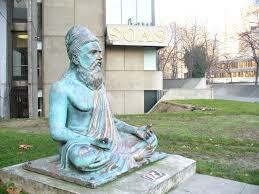 Ps if anyone is inspired to do the MA in the Traditions of Yoga and Meditation at SOAS, I can highly recommend it. It has absolutely exceeded my expectations. US friends, there is a similar course, I believe, at Loyola Marymount University. These are the only two universities that offer it, as far as I’m aware.